The Chicago Department of Transportation has announced its proposed lane configuration for the Central Loop East-West Transit Corridor. 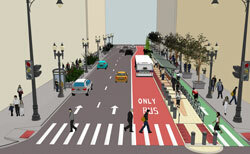 The corridor, which involves the installation of two miles of dedicated bus lanes and protected bike lanes in the Loop, is scheduled for completion in 2014. The Central Loop Corridor will serve Union Station, Ogilvie Transportation Center, CTA subways and Navy Pier. Connectivity between these destinations would be improved through a combination of dedicated bus lanes with Bus Rapid Transit features along with protected bike lanes. Rendering of proposed lane configuration on Washington. 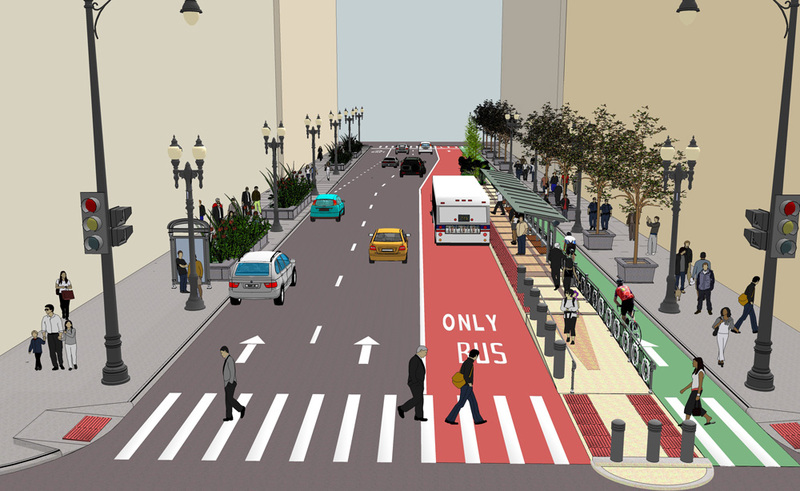 Under the proposed plan, dedicated bus lanes would be installed on Madison, Washington, Canal, and Clinton. The design calls for the use of colored pavement markings, level boarding stations, queue jumps at key intersections, and real-time arrival information displays. Multiple bus routes would benefit from the BRT features in the corridor, including the J14, 20, 56, 60, 124, and 157. Trip times are estimated to improve by 3 to 9 minutes per trip. In addition to the bus lanes, physically separated protected bike lanes would be installed on Washington for eastbound cyclists and on Randolph for westbound cyclists. The existing conventional bike lane on Madison would be removed in favor of the new protected lane on Randolph. Rendering of proposed Union Station Transportation Center. 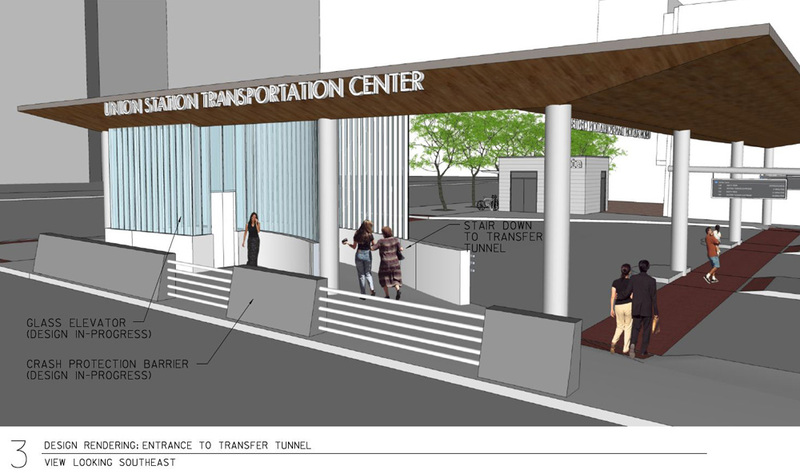 The plans also call for a new Union Station Transit Center on Jackson, just south of Union Station, that will provide sheltered boarding areas with room for 12 CTA buses. Direct access to and from Union Station would be provided via an underground walkway. The project is being funded by a $24.6 million Federal Transit Administration grant and $7.3 million in local Tax Increment Financing funds. As part of the design process for the Central Loop project, CDOT looked at design options that ranged from a low cost “basic” plan to a more extreme “focused” plan that would have eliminated vehicular thru-traffic on Madison. CDOT chose the “balanced” plan as it was the most cost-effective option and presented fewer operational challenges.